Kong: Skull Island is finally a monster movie worthy of the King of the Apes. Kong, who has been a monster movie staple since his first iconic appearance in 1933, has been in countless movies over the decades but many have chosen to simply retell the same story again and again. Skull Island is a clear departure from that and we are all better for it. Skull Island is a war movie more than anything. The core of the action takes place in 1973 during the last days of the Vietnam War. This creates immediate tension among the main characters, most of which are leftovers from the war. The film itself breaks into three separate groups. There are the scientists led by Bill Randa (John Goodman) and Houston Brooks (Corey Hawkins), the military unit led by Colonel Preston Packard (Samuel L. Jackson) and the consultants more or less led by James Conrad (Tom Hiddleston). This allows for a variety of adventures on the island and multiple viewpoints on the nature of the situation to emerge. This creates far more tension and world building than any other Kong movie that has come before it. The past couple of months have seen a rise in films that fit the style and tone of a comic book. And while Skull Island may not have that source material it is clear that is where much of its inspiration comes from. The very first scene alone feels like something out of the Golden Age of pulp fiction and it carries that tone through pretty much the rest of the movie. The elements are all there: the mysterious island, the rugged military men, the damsel in distress (played by Brie Larson, who instantly turns that idea on its head) and the crazy monsters. Yet instead of simply retelling a story we’ve heard before the film creates a brand new universe filled with some of the most creative monsters ever put to screen. This might be the one Kong film that actually gives respect to the island’s inhabitants as well. For decades the natives of Skull Island have been portrayed as simple savages playing into African tribal stereotypes. What Skull Island does instead is take a deeper look into their culture and actually spend real time with them. Larson’s character is on board the mission as a war photographer allows the film to stop and breathe every so often and literally take in all the little details. From time-to-time the audience gets the see the world through Larson’s lens and that takes away the filter of the film creating a much more realistic environment. Watching Larson interact with the natives makes you actually care about them. These are intelligent people that have their own culture, not some group of savages that will worship you for carrying matches. Something needs to be said about the monster as well. Every single one of them is unique and scary in its own way. The filmmakers were clearly sick of the “it’s scary because it’s bigger” trope and created brand new monsters for Kong and the others to fight. The result is a strange fusion of Asian mythology, anime and the old Universal monster movies. it is glorious to see on the big screen. Strangely, Skull Island’s natural counterpart should be King Kong 1976 but that couldn’t be farther from the truth. Despite taking place in almost the same time period Kong ’76 actually shied away from the relevant topics of the day in favor of a lighter tone. 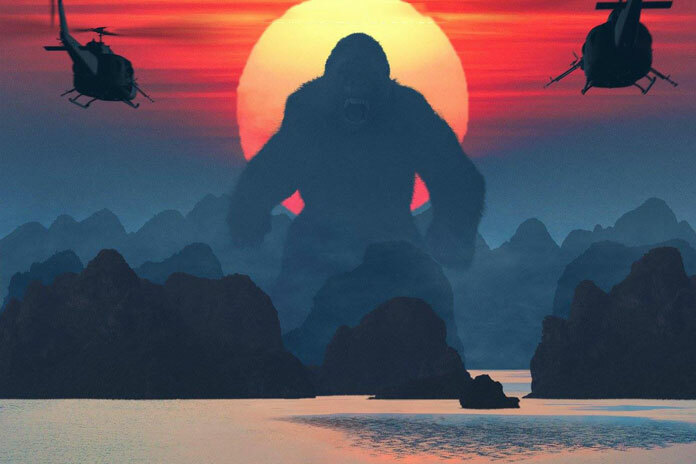 Kong: Skull Island is the film that Kong ’76 should have been. Honestly, there is so much to Kong: Skull Island that shouldn’t be spoiled. The best way to experience this unique film is to simply see it. Given the scope and focus on action it is recommended that you see it on as big a screen as possible.